All single tickets will be released exclusively via a digital lottery held in partnership with TodayTix. To enter the lottery, visit the show page using the TodayTix app (available in the Apple app store and the Google Play store) or the TodayTix website. Selected winners will be notified weekly on Fridays and will gain access to a one-on-one performance slot. If you have been selected, the Woolly Mammoth box office will reach out to confirm your performance time. In 2016, Tania El Khoury commissioned musician and street artist Basel Zaraa, who was born a refugee in Syria, to record a rap song inspired by the journey his sisters made from Damascus to Sweden. As Far As My Fingertips Take Me, the intimate theater-for-one experience that El Khoury designed around Zaraa’s music, asks us whether we need to literally “feel” a refugee in order to understand the effect of border discrimination on peoples’ lives. At first, you won’t be able to see who is behind the wall. 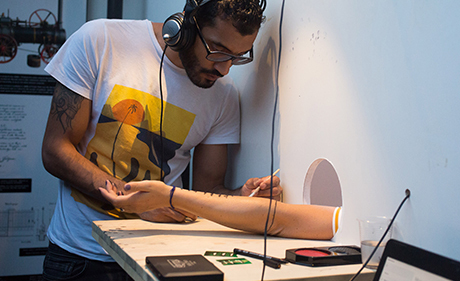 You will reach through a hole, and allow your arm to be drawn on while you listen to a song. The drawing can be kept or washed away; the choice will be yours. You may not, however, be able to wash away the experience... or the connection you will make through that wall. "His tale doesn’t just touch me in a fleeting way—as the many stories and images reported in the newspapers do—it goes further. It marks me." 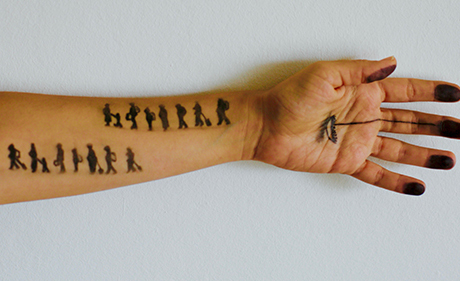 "AS FAR AS MY FINGERTIPS TAKE ME is a moving account of displacement." TANIA EL KHOURY is a live artist whose work focuses on audience interactivity and is concerned with the ethical and political potential of such encounters. 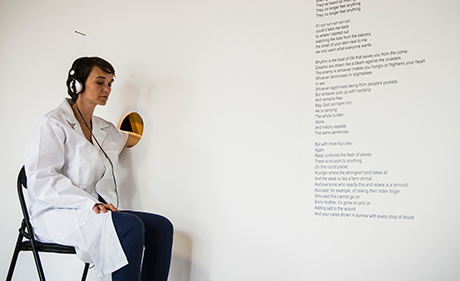 She creates installations and performances in which the audience is an active collaborator. Her solo work has toured internationally, and for which she is the recipient of the Anti Festival’s International Prize for Live Art, the Total Theatre Innovation Award, and the Arches Brick Award. 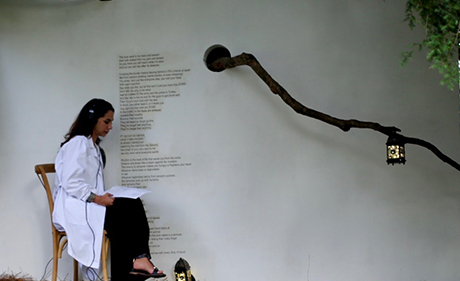 Tania is associated with Forest Fringe in the UK and is the co-founder of Dictaphone Group, a research and performance collective in Beirut creating site-specific performances that question our relationship to the city and redefine its public space. She holds a PhD in Theatre Studies from Royal Holloway, University of London, where she was funded by Arts and Humanities Research Council. BASEL ZARAA is a spoken word artist and percussionist who writes on themes of exile and resistance. He has collaborated with a wide range of international artists including Akala, Guildhall youth project (Im)possibilities, Palestinian hip-hop group Katibeh Khamseh, Arabic fusion band Raast and funk band Shokunin. He is part of the cast of PsycheDELIGHT's Borderline satire about the Calais camp, in which he performs original music and DIY sound effects. He is also a visual and stencil graffiti artist and is currently touring with Tania El Khoury's As Far As My Fingertips Take Me.